Portable Document Format aka PDF files are one of the most used document files, from a student to an employee, everyone nowadays uses them. But there are many you don’t have a proper editor for creating or editing pdf documents, even though there are many editors out there in the market, but most applications miss out on some essential features. And many users don’t prefer to use some application which doesn’t give them a complete control over the pdf documents. Now for those users who wants to have a complete control over their pdf files then you might be happy to know there is one feature rich application called iSkysoft PDF Editor Pro, which permits you to do anything you anything you want to with your pdf file. And while we are on this subject, we thought of doing a full review of the iSkysoft PDF Editor Pro version for MAC. Why go with iSkysoft PDF Editor Pro For Mac? Well this is the big buck question, and surely there are editors out there in the market, but overall, if you look at the price to performance ratio, then iSkysoft PDF Editor Pro for MAC tops the list, this PDF file editor takes editing to the next level, giving you more than editing, and cut, copy, and paste. Editing PDF files with the iSkysoft application are much easier. Now to begin editing a PDF file, first of all, launch the iSkysoft Editor Pro application, then import the PDF file, which you want to edit. Once the PDF file is open, move your cursor to the right-hand top most corner, and then click on the “OCR” button, and then choose from the specified language using which you want to edit the document. After that, click on the “Edit” option available at the middle of the toolbar window. Now to edit any part of the text, you can double-click on it or select the particular area, where you want to do the editing. Moving ahead, if you want to edit or import an image, you do that too, if you want to edit an image present in the PDF file, then first click on the “Edit” option, then double click or select the particular image to crop, delete or resize it. Furthermore, you can even insert an image in a desired area if you want too, to do that, first of all, open the pdf file, then click on the “Edit” and select a particular area where you want to insert the image, then at the right-hand side click on the add image, then select the image you want to insert. Once the image gets inserted, then click you can easily resize it or crop it. 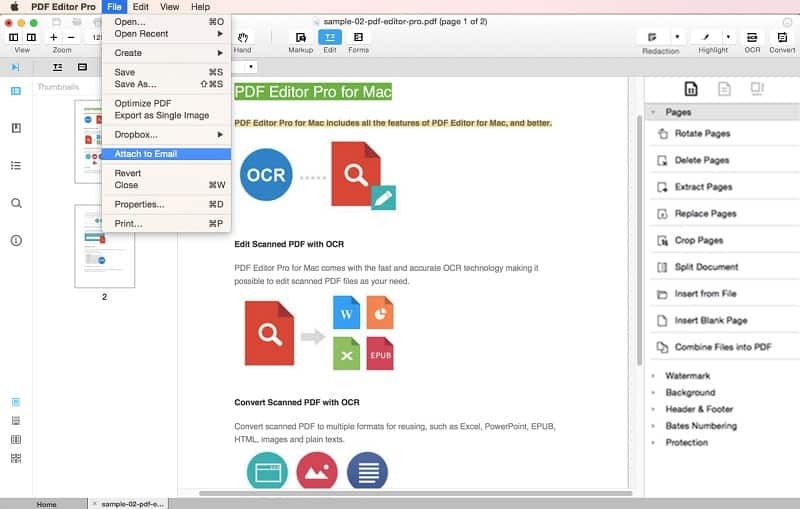 With the iSkysoft Editor Pro version for Mac, you can also edit an entire PDF page. To edit a PDF file page, import the file, next you see a bunch of options aligned right with the document, just select from the options like “Rotate Pages”, “Delete Pages”, “Replace Pages, etc to modify the entire the page. Apart from that, you can also combine, split and compress a PDF file using iSkysoft PDF Editor Pro application. First, let’s begin with splitting a document, for doing that launch the iSkysoft PDF Editor Pro application, and then just like before, import a document, at the right-hand side of the window, you will find an option “Split Document”. Once you click that option, a “Split Document” window will appear, select the number of pages you want to split the current file and then select the desired location, after that just click on “Ok”. In case, if you want to combine multiple PDF files into one, then just launch the application, import the documents you want to combine, then click on the “Document” menu available at the top and select “Merge Document”. After you select that option a new dialog box will open now you can either drag & drop the files or you can click on the “Add files” button to add the files, once you are finishing adding the files just click on the merge option to merge the files. The iSkysoft PDF Editor Pro also lets you compress a pdf file, in order to compress a file, just open that file, click on the “File” menu, and select “Optimize PDF” , before optimizing the file you can also see a preview of the file and modify some changes if you want to. 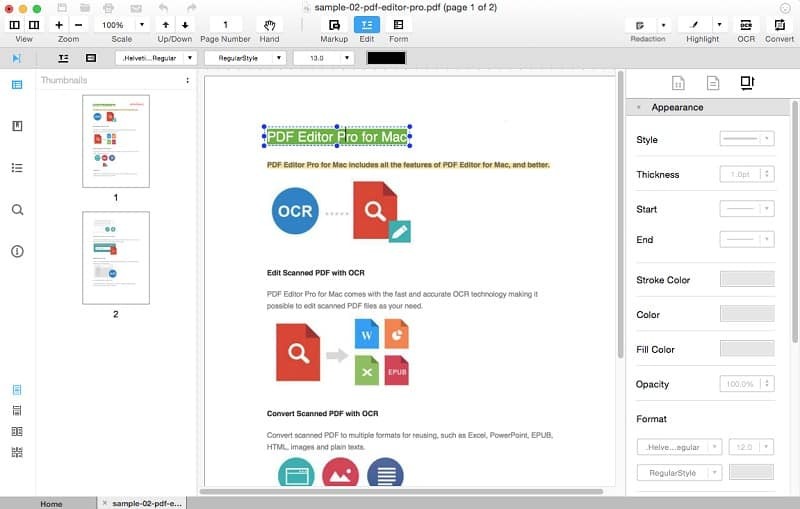 With the iSkysoft PDF Editor Pro for Mac, you can also annotate text or images, to do that, just launch the application, open a document, and then click on the “Markup” option, which you find right along with the “Edit” option. Under the “Markup” tab, you will find several options like adding sticky notes, text boxes, underline, radio buttons, etc., in addition to that, there is also some drawing tools available using which you can highlight some area by drawing arrows, rectangles, lines, etc. 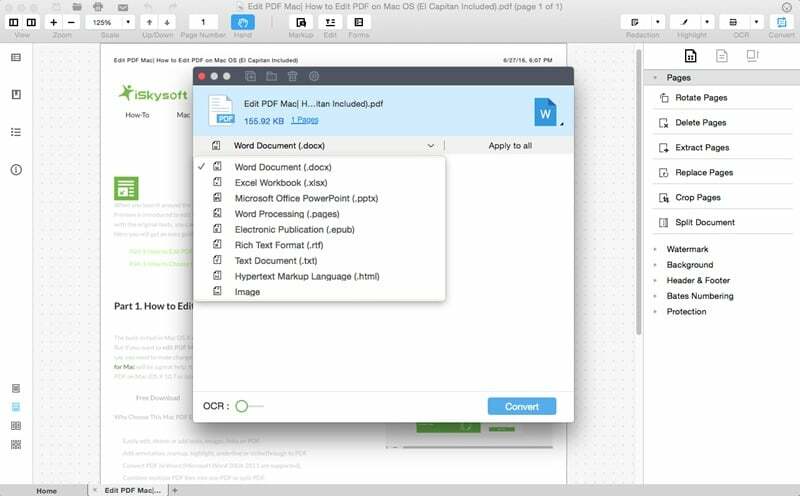 The iSkysoft PDF Editor Pro for Mac also lets users convert and create pdf files, for instance, using this application you can convert an existing PDF file into a word, power point, excel, image, text and many other formats. 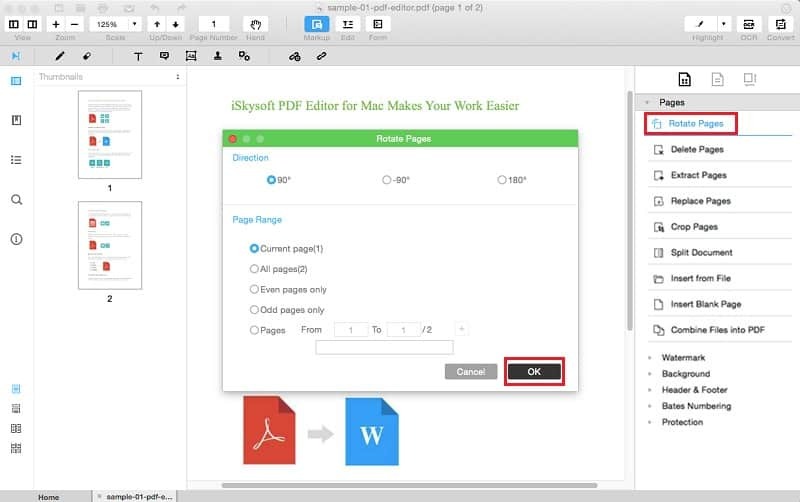 In order to format a pdf file, open the iSkysoft pdf editor, then open the desired pdf file, which you want to convert, now click on the “Convert” option available in the toolbar menu, once you click that option, a dialog box will appear, now just select the format in which you want to convert the pdf document. 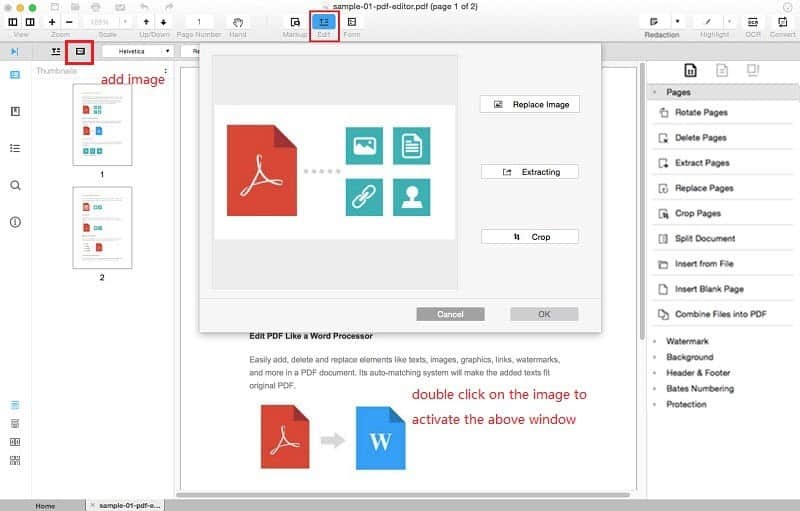 If you want to create a PDF file just open the application, click on “Create PDF”, now a pop-up window will appear, click on the “Open” option and select the particular file, which you want to convert, once the file is opened up, click on “File” and select the save as PDF option. With iSkySoft PDF Editor Pro For Mac, you can easily convert image, text, HTML, etc. files into PDF documents. As mentioned earlier, iSkysoft is a feature loaded application and comes with great set of features using some you can even secure your PDF files. 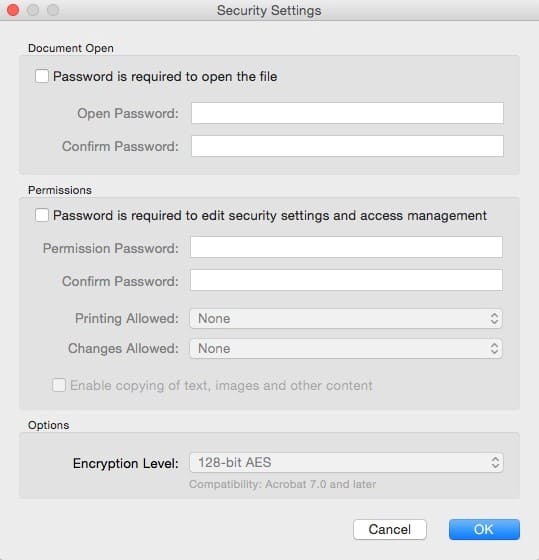 With this application you can lock your PDF document by providing a password, and the whole process is quite easy just open the pdf file, click on “File” >> “Security” >> “Security Settings”, and then enter your desired password. You can also add “Watermark” in your pdf file, just open the particular file, on the right-hand side click on the “Watermark” option, after that a pop-up window will appear, enter the text or an image if you want to, you can modify other settings like Opacity, Rotation, vertical distance, etc and then click on “OK”. Besides assigning password & watermark, you can also put your signature in a PDF document, and you can do that quite easily. Just open a particular file, from the toolbar menu, click on the “Stamp” icon, now from the drop-down menu, click on “More”. A Dynamic stamp dialog box will show up, at the bottom, you will find a plus sign, click on that and import the image file that contains your signature. Once you get the file, click on done, and the locate the image file on that pdf file that’s it. 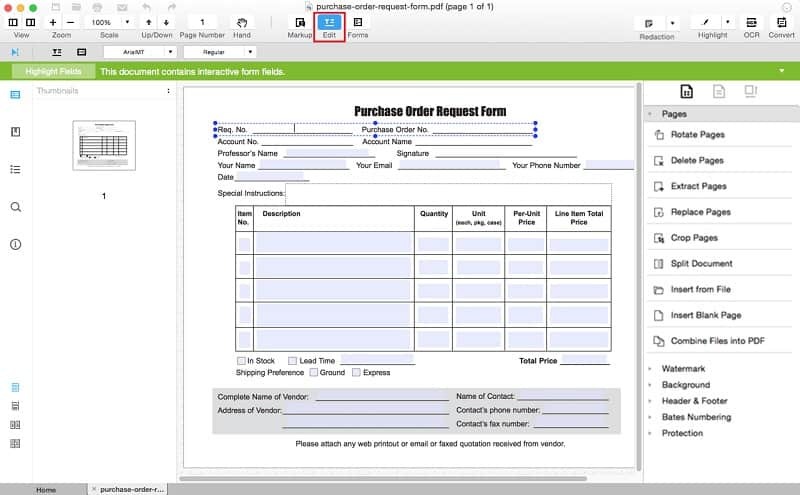 The iSkysoft PDF Editor Pro for Mac also lets you fill and create forms. In order to fill a form, just load the target file and then click on the “Edit” option and click “Add texts” and then select “Text Box” after that move the text box in the particular area of the form and then fill it out. Likewise, you can also create forms using this application, just import the PDF file, click on the “Form” menu, next, select the field, which you want to add in the selected form and place them. Using the iSkysoft application, you can easily share your PDF files, just open the pdf document, click on “File” menu and select “Email”. Once you click on that option a pop-up dialog box will appear, you will see multiple Email options to choose from, now select your preferred email and then click on “Continue”. 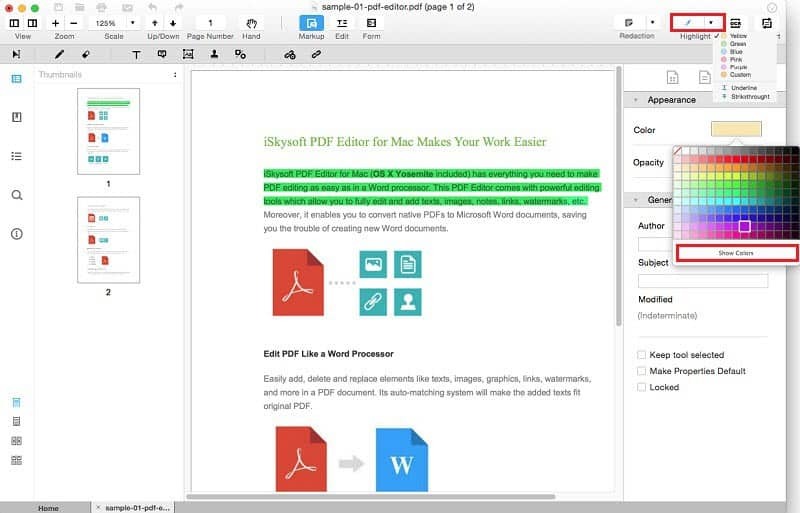 Overall, the iSkysoft PDF Editor Pro for Mac is one of the best and intuitive tools you will find for editing PDF files; it includes some amazing features, which you will not find in other top most PDF editors. Its UI is very user-friendly and can be used anyone without any hassle, in addition, the price of this application is also quite low compared to others.